I have a problem. I have way too much makeup. No way will I ever have enough makeup bags to hold all my products! 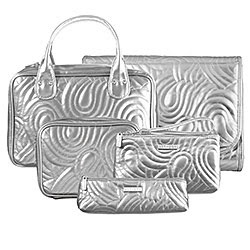 Or so I thought, until I came across the Sephora Brand Silver Swirl Bag Collection. With these bags at the ready, I now have a place for everything in my collection, from eyeliner and brushes to lipstick and blush. 1) Large Handle Bag ($38): My fave of the bunch. This square-shaped bag zips open to reveal three mesh pouches and a zippered pocket -- perfect for storing all of my treasured essentials. 2) Pencil Case ($16): This 8" long pouch can hold so many brushes and eye pencils -- even my extra-long eyelash comb! And its narrow size lends itself perfectly to fitting inside my bag for easy toting ability. 3) Clutch Bag ($18): Looking for a makeup bag that doubles as an evening clutch? This is the one! It's got a wrist strap, so you can carry it easily -- and the subtle rectangular shape is designed with an interior pouch that perfectly fits a cell phone! The other bags available are the Medium Cosmetic Case ($20) and the Hanging Bag ($48). All are available on Sephora's website. Fabulousness? It might come cheaper than you think. Great find -- a classic pick for year round. Thanks! Thanks! I love these bags!